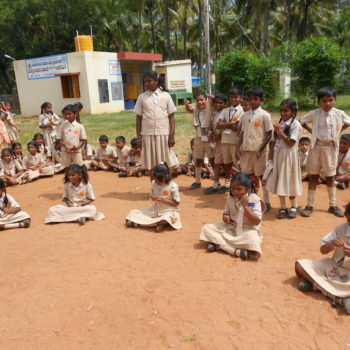 Literacy was very low in Bogadi and the surrounding villages as there were no schools in the region. 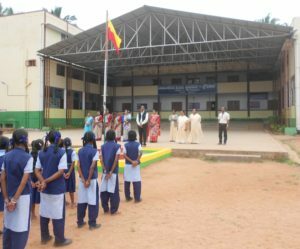 Sr Severine Barrows who was elected Superior General in 1986 decided to open a school in the campus, a decision rightly taken. 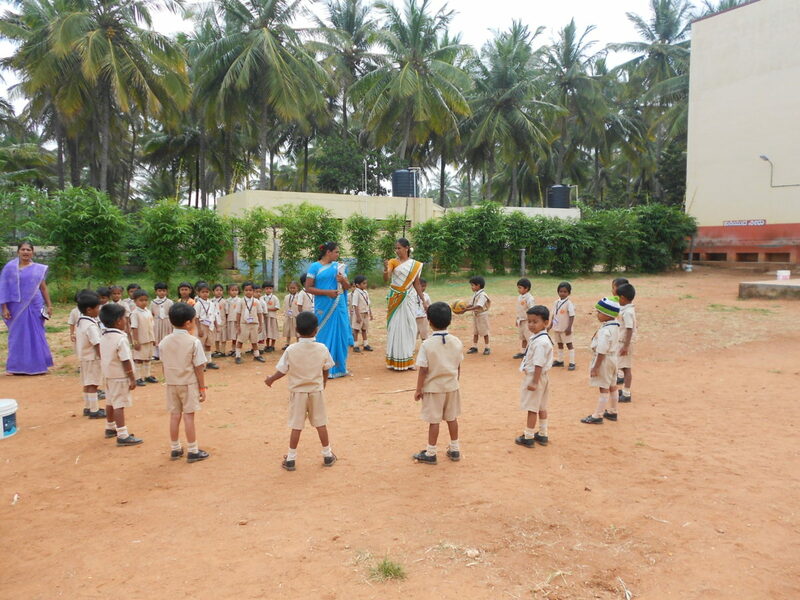 In 1987 a Kannada nursery and Class I were started in a small building which later became the Health Centre. 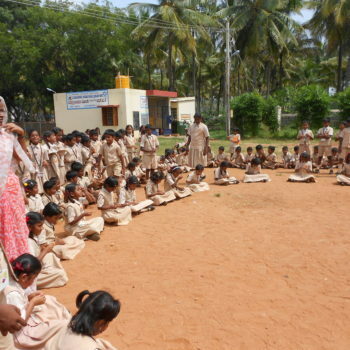 Since then Bogadi got a facelift and a steady development was seen in the living standards of the people. 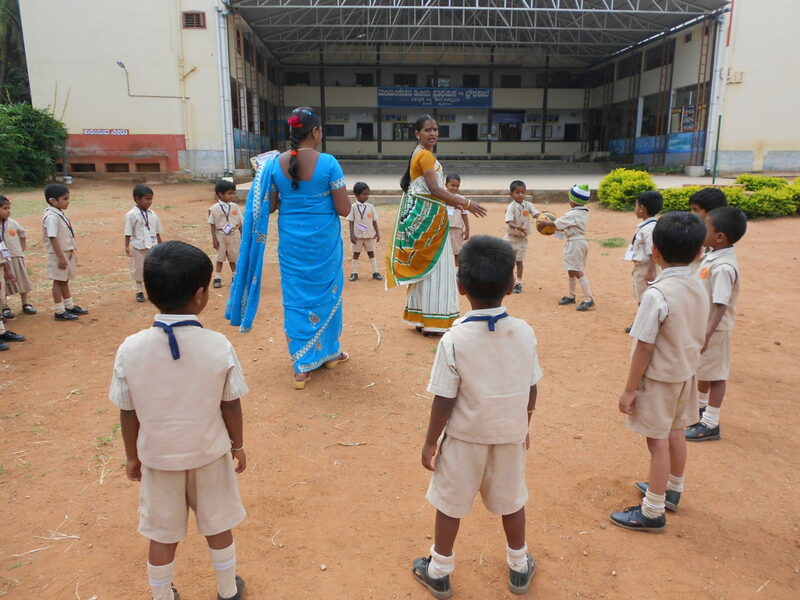 Maria Niketan School could well be said to be the foundation for the Bogadi township. Sr Gemma Pinto worked hard to obtain permission. 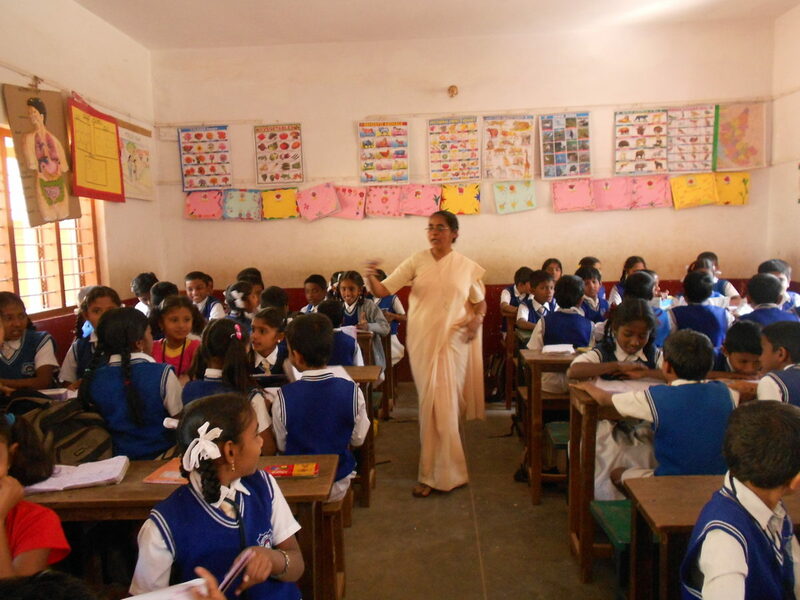 Sr Jacintha Quadros was the first headmistress (1988-90) of the school. 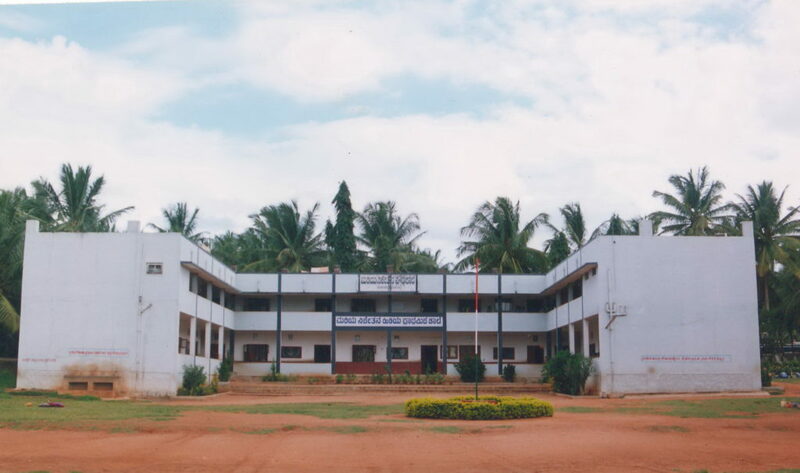 Later as Sr Lilly Rodrigues (1990-98) who took charge as headmistress, planned to construct the school building with spacious classrooms. Thanks to the financial help from the Generalate. Within a few years Maria Niketan became the talk of the town. 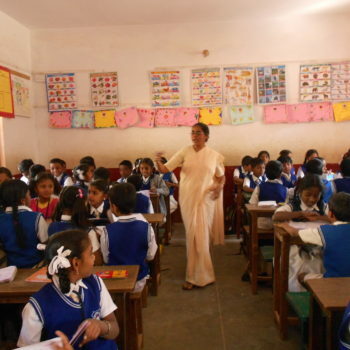 People realized the value of education and many girl children, who would have otherwise remained illiterate, were able to do their schooling at Maria Niketan. 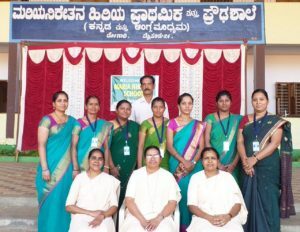 The succeeding headmistresses Sr Pushpa (1998-2004) and Sr Violet Menezes (2004-2008), effective, efficient and hardworking made Maria Niketan the Best School in Mysore Taluk. In the year 2008 Sr Flavia Fernandes took the wand from Sr Violet. 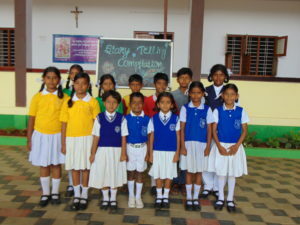 The process of getting grant- in-aid for the School was earlier initiated by Sr Violet. But it was Sr Flavia who never rested until she got all the papers cleared for permission. 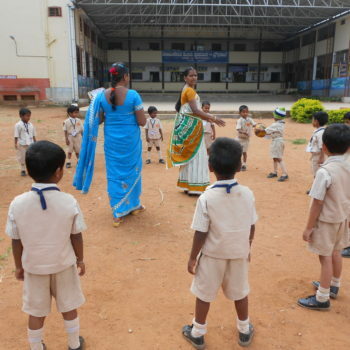 Running from pillar to post she succeeded in getting the school under grant-in-aid in 2009. On December 19, 2013, the School celebrated the silver jubilee in all solemnity. 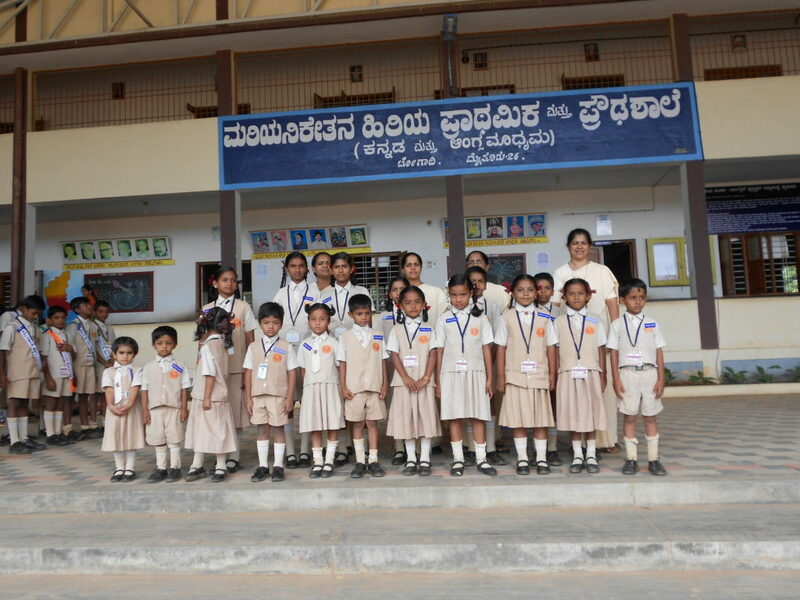 1615 students have successfully completed their studies and have passed through the portals of this school. 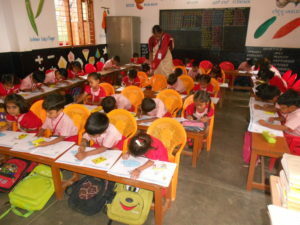 At present there are 453 students in the primary and pre-primary section. 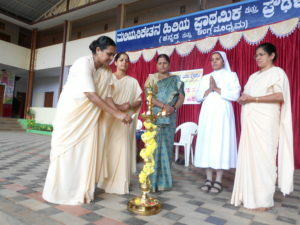 Sr Mary Celine hails from Mysore south. 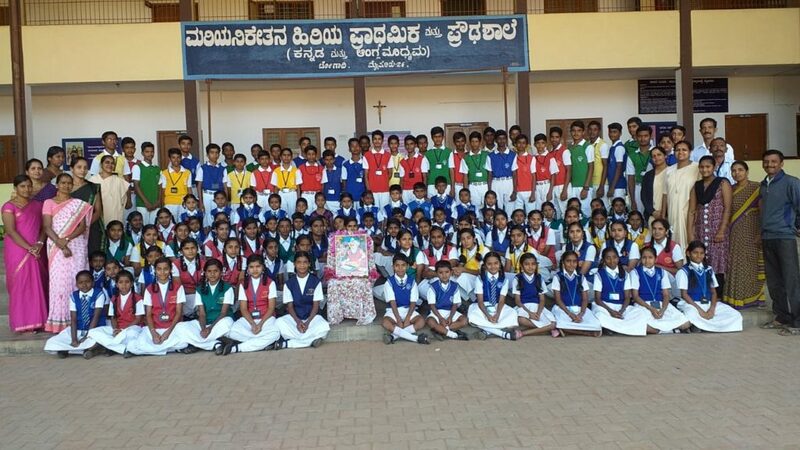 She did her Primary Education in St Rita’s Higher Primary School, Mysore South and completed her High School Studies in St. Mary’s High School, Chamundipuram. 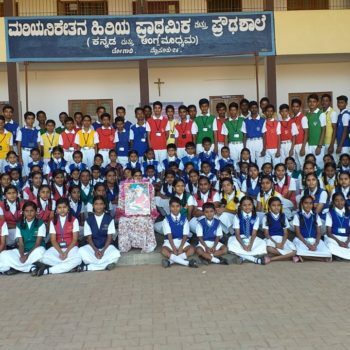 She attended her Pre University College studies in St. Aloysius College, Mangalore and Professional Studies at Sacred Heart Teacher Training Institute, Jayanagar, Bangalore. 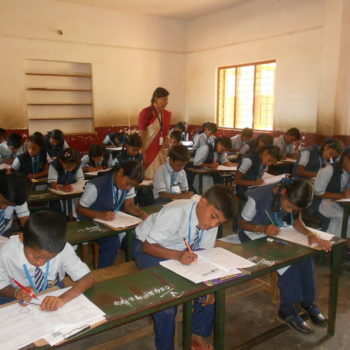 She has her Degree Bachelor in Arts from Mysore University, Manasa Gangothri, Mysore and Bachelor in Education from Indira Gandhi Institute of Higher Education, Coimbatore. 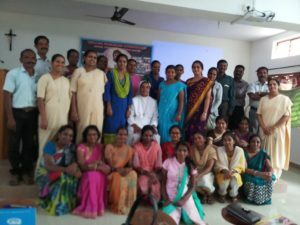 Sr. Mary Celine has done her NLP training in Bangalore, Basic Counselling skills training in Mangalore. 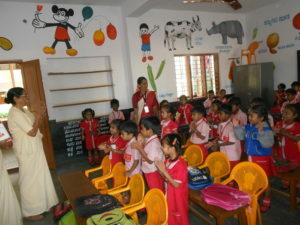 Sr Mary Celine has vast experience to her credit as a teacher. 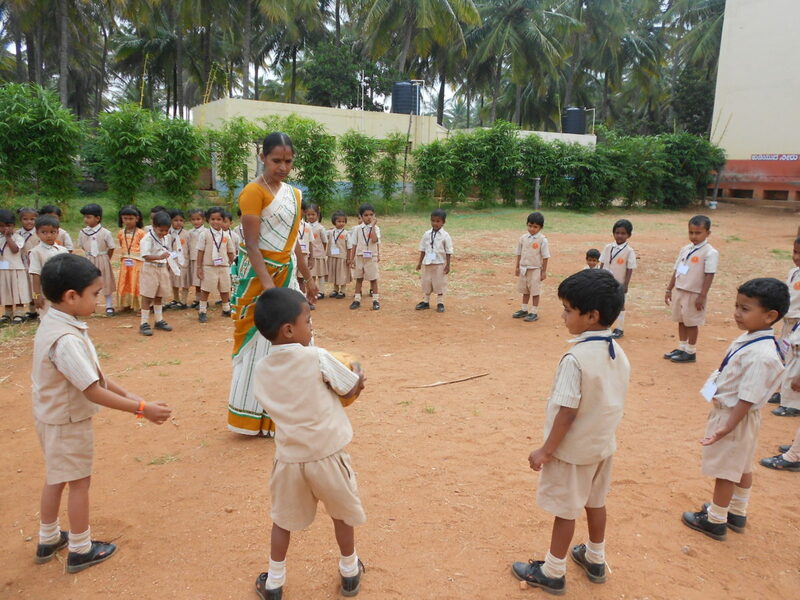 She worked as a teacher in St. Mary’s Hr Pry School, H.D.Kote, Maria Nikethan HPS, Bogadi, St. Antony HPS, Suntikoppa, St.Joseph’s HPS, Hunsur, Shanthi HPS Shanthipura, and St.Joseph’s HPS, Hunsur. 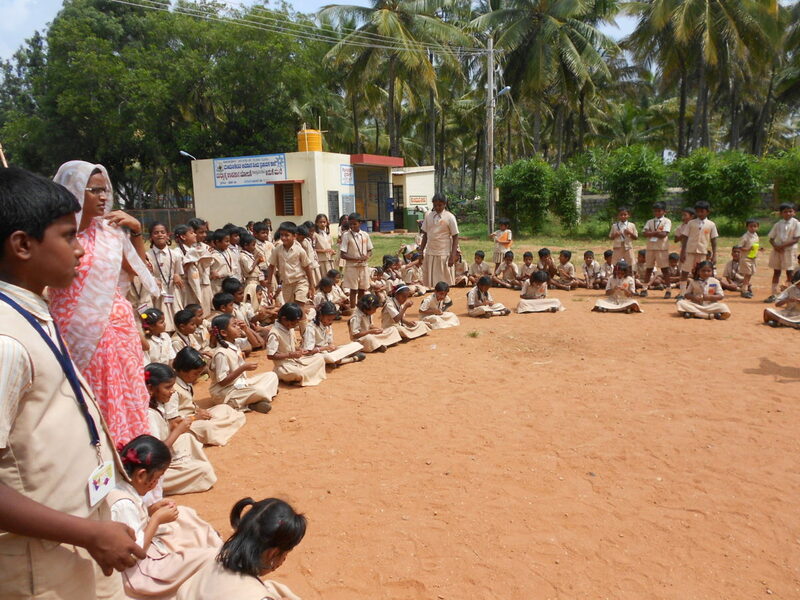 Since Five years she is the Headmistress of Maria Nikethan HPS, Bogadi. Sr Gemma Pinto worked hard to obtain permission. 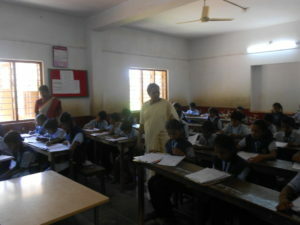 Sr Jacintha Quadros was the first headmistress. (1988-90). 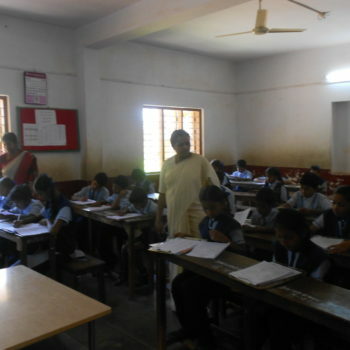 Later as Sr Lilly Rodrigues (1990-98) who took charge as headmistress, planned to construct the school building with spacious classrooms. 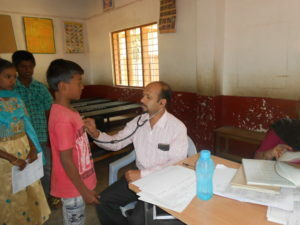 Thanks to the financial help from the Generalate. Within a few years Maria Niketan became the talk of the town. 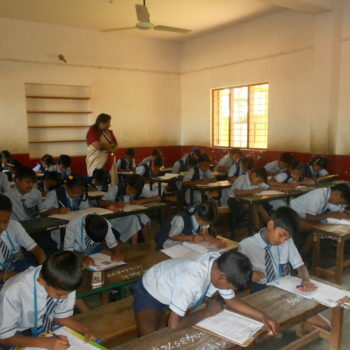 People realized the value of education and many girl children, who would have otherwise remained illiterate, were able to do their schooling at Maria Niketan. The succeeding headmistresses SrPushpa (1998-2004) and Sr Violet Menezes (2004-2008), effective, efficient and hardworking made Maria Niketan the Best School in Mysore Taluk. 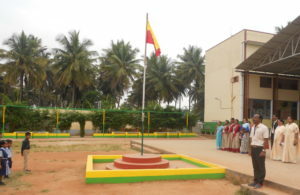 On November 30, 2006 the Chief Minister, MrKumaraswamy paid a visit to Maria Niketan. 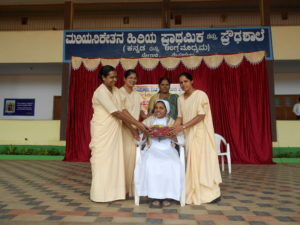 In the year 2008 SrFlaviaFernandes took the wand from Sr Violet. 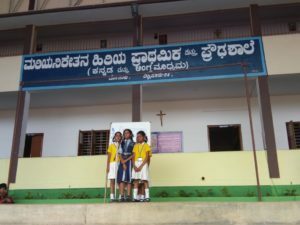 The process of getting grant- in-aid for the School was earlier initiated by Sr Violet. But it was SrFlavia who never rested until she got all the papers cleared for permission. 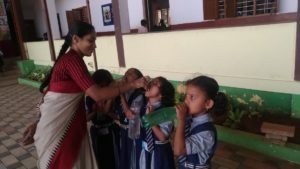 She and SrPushpa D’Souza, her assistant travelled umpteen times to Bangalore, running from pillar to post till they succeeded in getting the school under grant-in-aid in 2009. 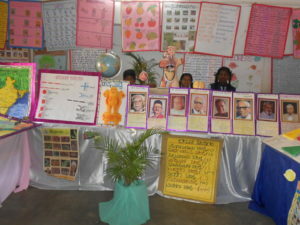 On December 19, 2013, the School celebrated the silver jubilee in all solemnity. 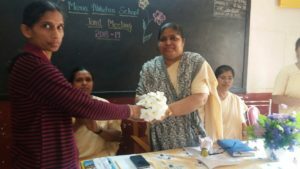 It was a sight to behold the old students and the parents in Maria Niketan Campus expressing their appreciation for the quality education they were privileged to receive at Maria Niketan over the years. 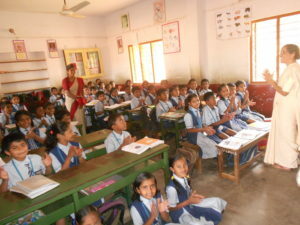 As continuous requests from the locals to start an English medium section would not cease, permission was obtained for Class VI-VII English medium in the year 2008. 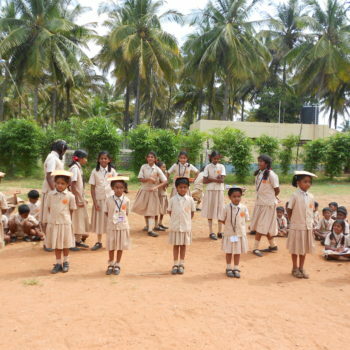 2205 students have successfully completed their studies and have passed through the portals of this school. 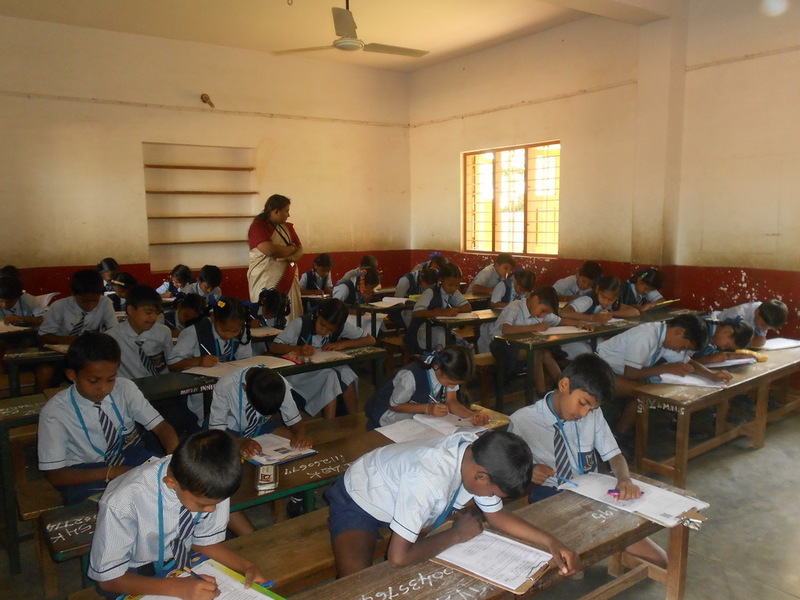 At present there are 453 students in the primary and pre-primary section. 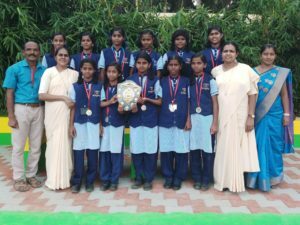 In the year 2015-16 Maria Niketan HPS participated in the programme under the theme Nurture the Nature and bagged second place with cash 3000/-Rupees. 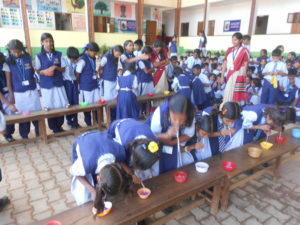 It was a great achievement of our school. 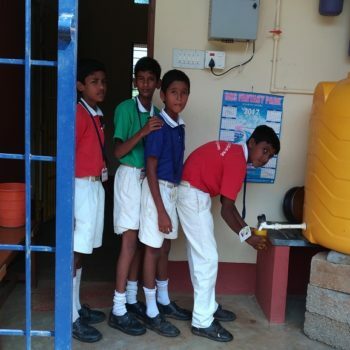 In the year 2015-16 a new Mid -day meal kitchen building worth of 6 lakhs was constructed with the help of the Government aid under ‘Akshara Dasoha yojane’ . 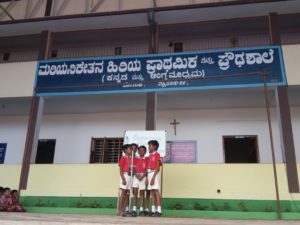 The School needs a multi-purpose hall and a well-equipped computer lab to provide better opportunities for children to enhance their learning. 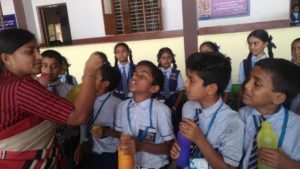 On 8th of February 2019 School Students and Staffs are given D-worm tablet from the Health Department, Bogadi, Mysore. 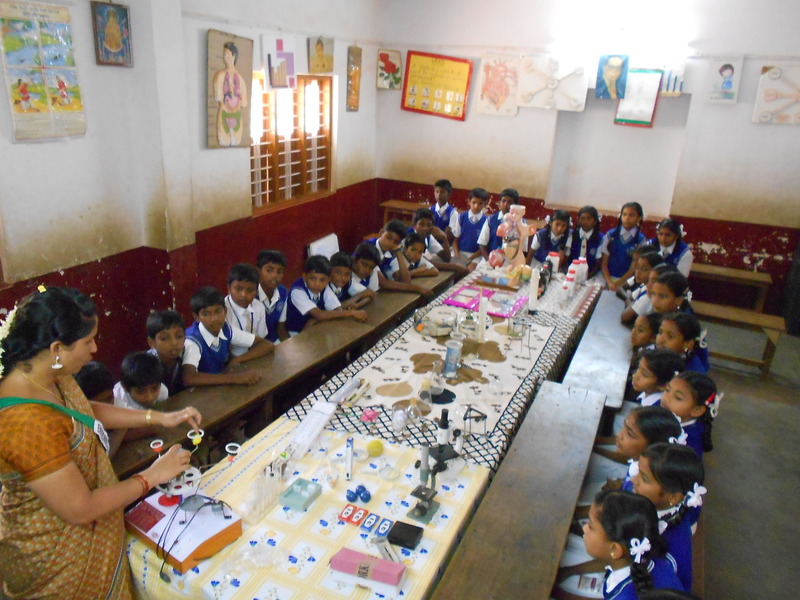 On 25th February 2019 at 9.30am Ursuline Franciscan Educational Society President Superior General Rev.Sr.Susheela Sequeira visited our Maria Niketan School. We are extremely happy by her visit. 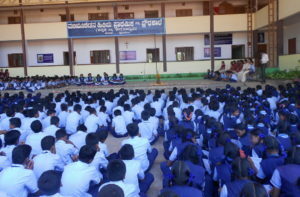 Students had some programmes. 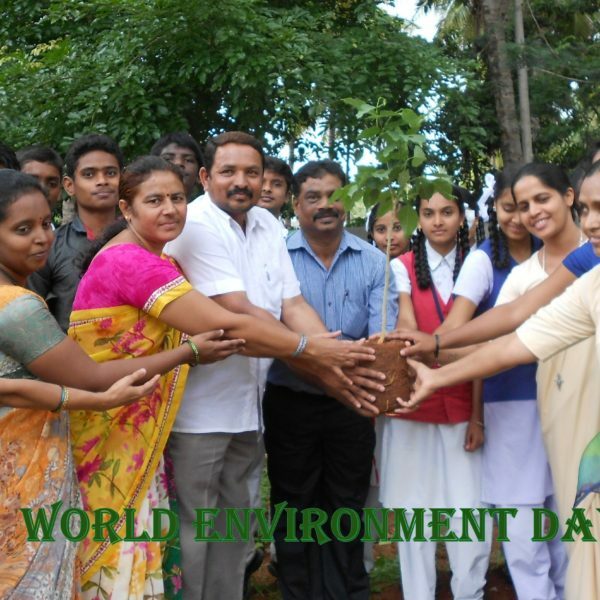 “Save the Earth, Heal the Earth” on this theme they enacted Superior General Rev. 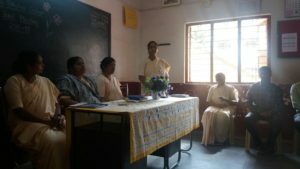 Sr. Susheela Sequeira delivered a message through the stories which will be very applicable to the student in their future . 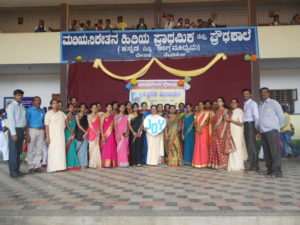 Also she met all the staff of the school and gave a message that “the students are in your hand, how you will make them responsible for their future”. 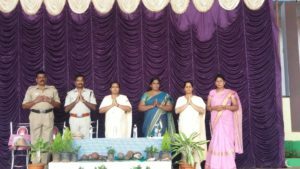 On 26th January 2019 we welcomed honorable chief guest Rev.Sr.Apoline Cordeiro. She hoisted the flag. 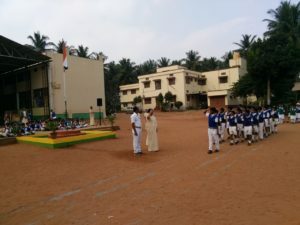 March past, exercises (drill) and speeches were the special events of the Republic Day celebrations. 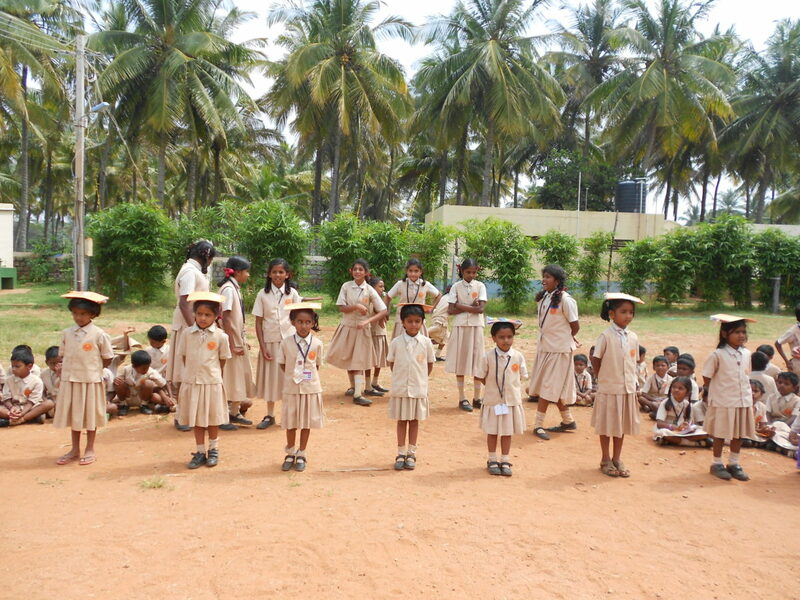 Children understood the importance of the day and we celebrated Republic Day in a good manner. 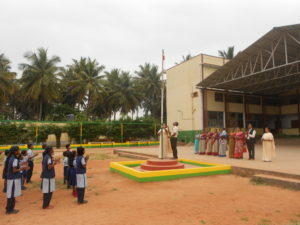 We paid respect to the national flag and to the nation. 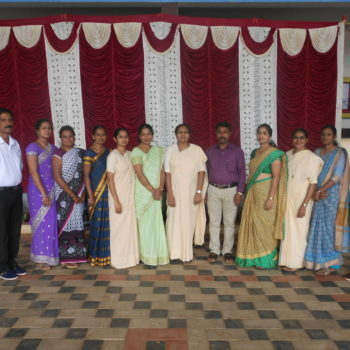 On 30th of January 2019 Sr. Ivy Fernandes had visited our school individually she met student’s class wise. 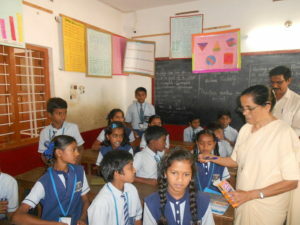 She asked some general knowledge guest ions and distributed stationery to all the students as reward she also taught some tongue twisters to them. 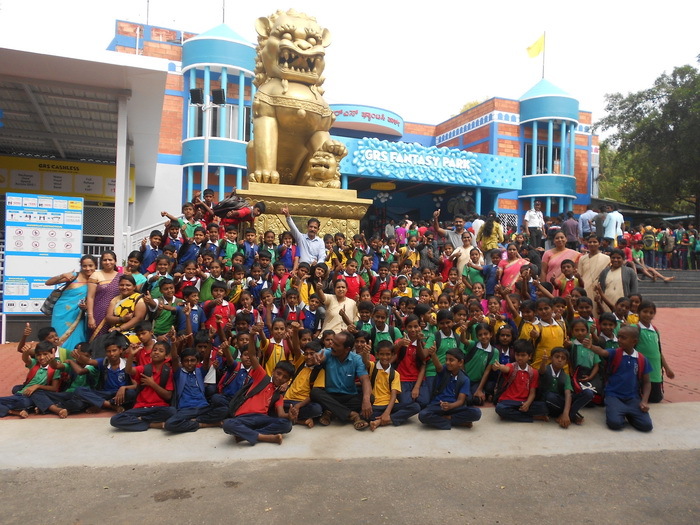 01.12.2018: One day Education trip to GRS Fantasy Park, held on 01-12-2018, students and teachers were enjoyed. 20.12.2018: We celebrated Christmas Day On 20th of December 2018. 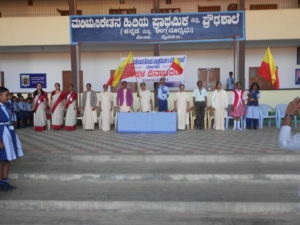 We welcomed honorable chief guest Rev. 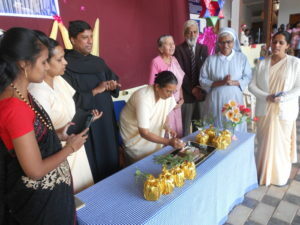 Sr Apoline Cordeiro and Rev.Fr Alponse Britto, also student’s grandparents were special guests for the Christmas celebration. 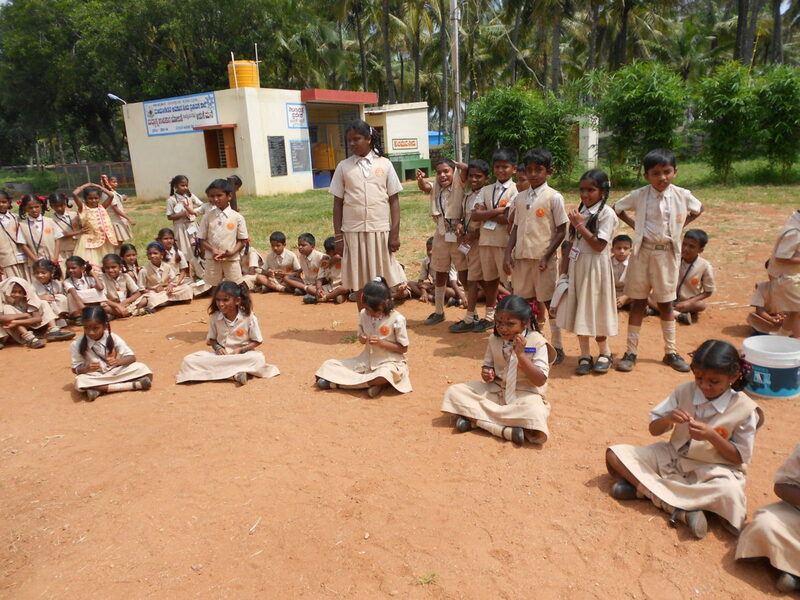 Day ended with distributed cakes to all. 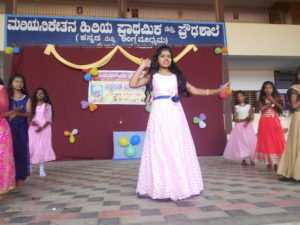 22.12.2018: On 22nd of December 2018 we had a School exhibition held at our school. We welcomed Rev. 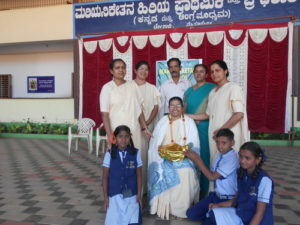 Sr Lilly Rodrigues as a chief guest. 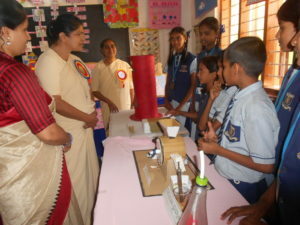 Many of the students brought their projects. 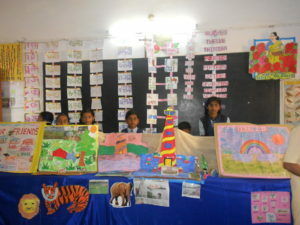 Our school teachers made them to stand in particular places with their projects. 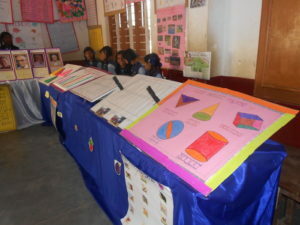 Students explained their projects and told the format about the projects. 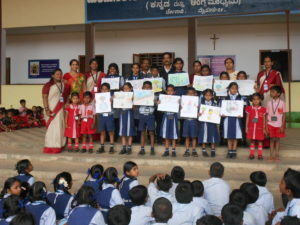 Some of the parents, students and other school teachers appreciated. We had a nice time on that day. 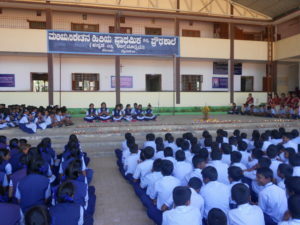 The project was based on the theme of the Congregation “Heal the Earth Save the Earth” along with that projects on all the subjects like, save environment, District of Mysore Division, Geographical Symbols, air and water pollution, rivers in India, model of parts of the body and languages etc. 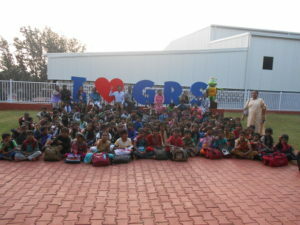 It was enriching day for all of us. 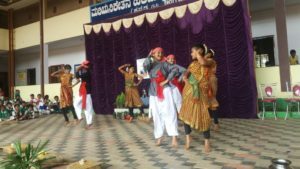 November 1st 2018 we Celebrated Kannada Rajyostava in a good manner. 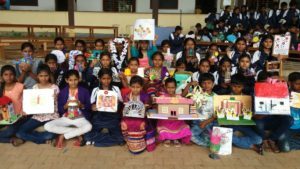 November 3rd 2018 students took part in different competitions. 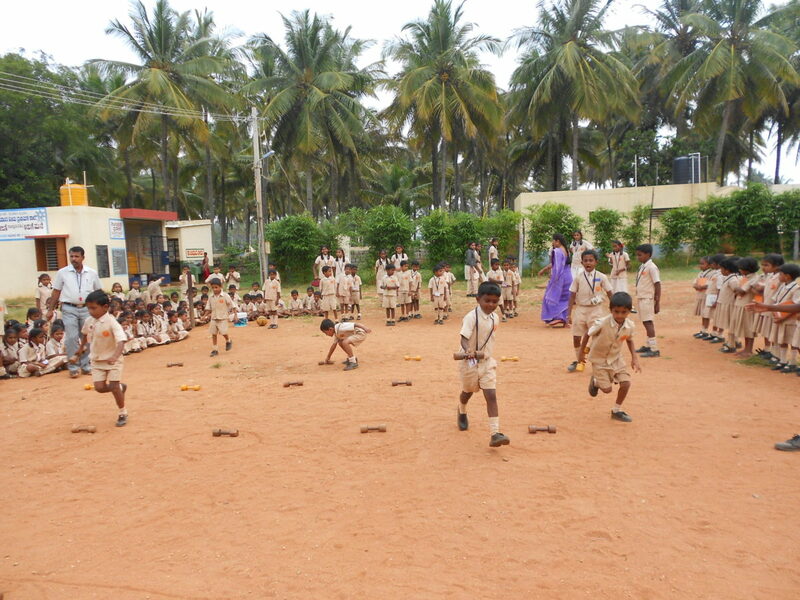 It was a great opportunity for students to try a range of different sporting activities and all of our students attended. November 5th 2018 the festival of lights. 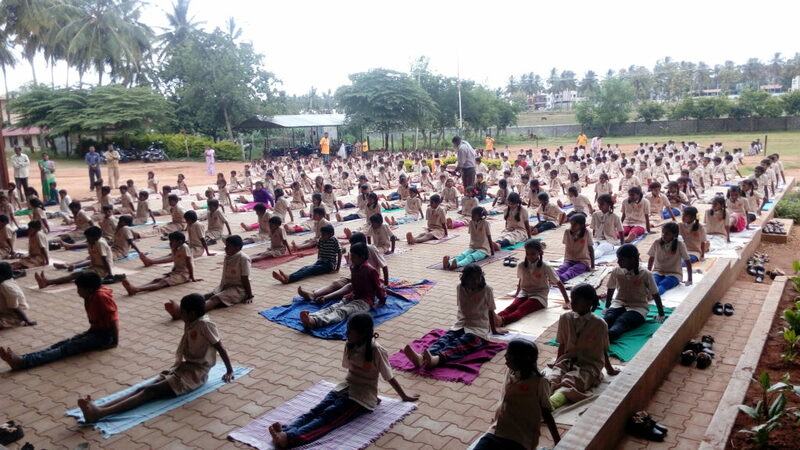 We wished our students to be the light of the nation. 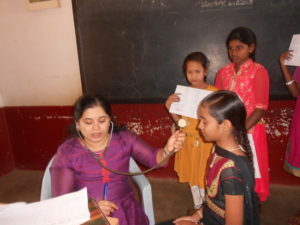 Medical checkup was done on Nov-14th 2018 from 1st standard to 7th standard students by the Health Department. 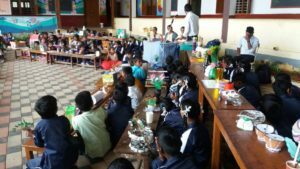 November 15th 2018 student took part in children’s day. 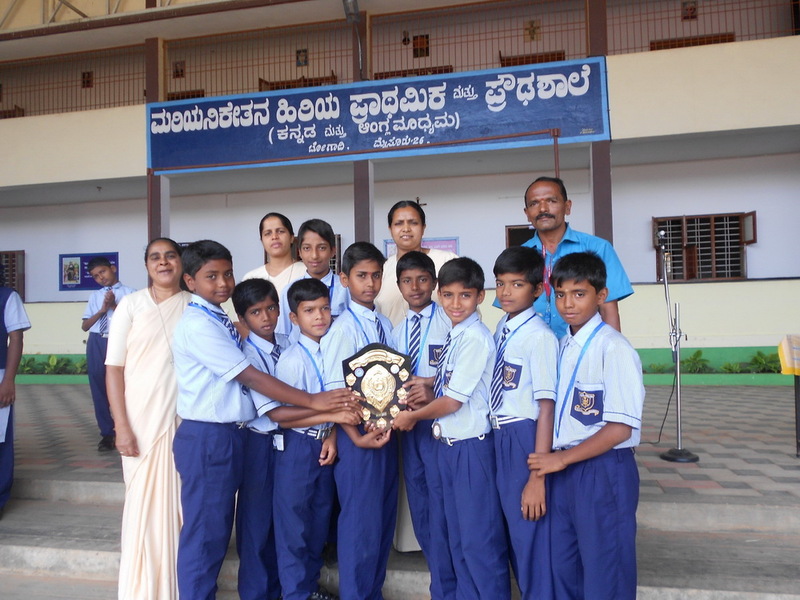 It was very wonderful for all of us to honor our state along with that we distributed prizes to the winners. 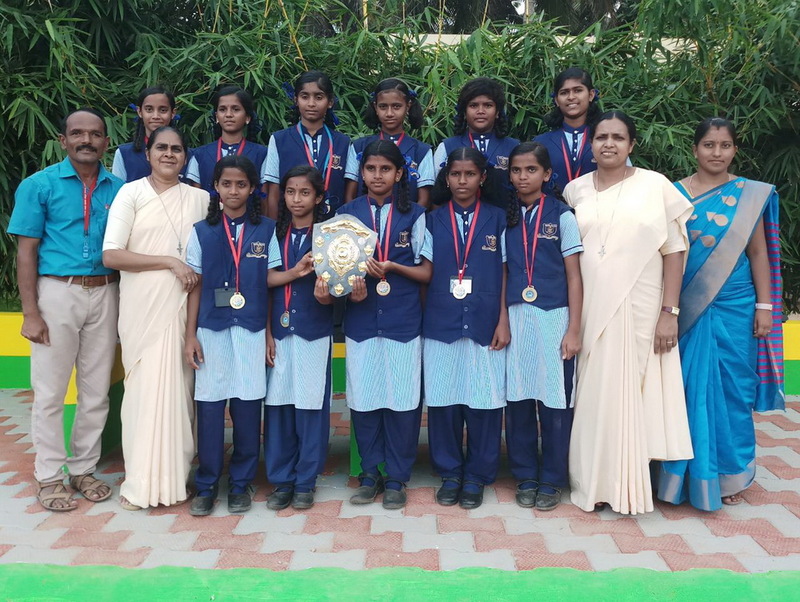 Special competition was conducted on Nov-17th 2018. 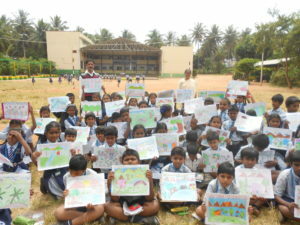 The theme was Heal the Earth, Save the Earth. 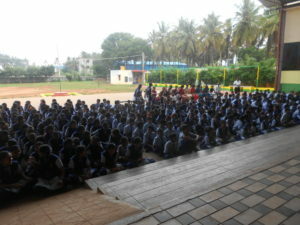 All our students took part in it. 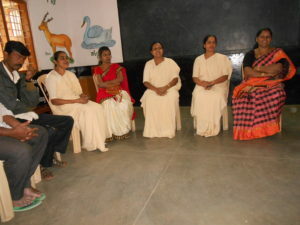 It was a great day for our students to put out their talents by participating in folk song. 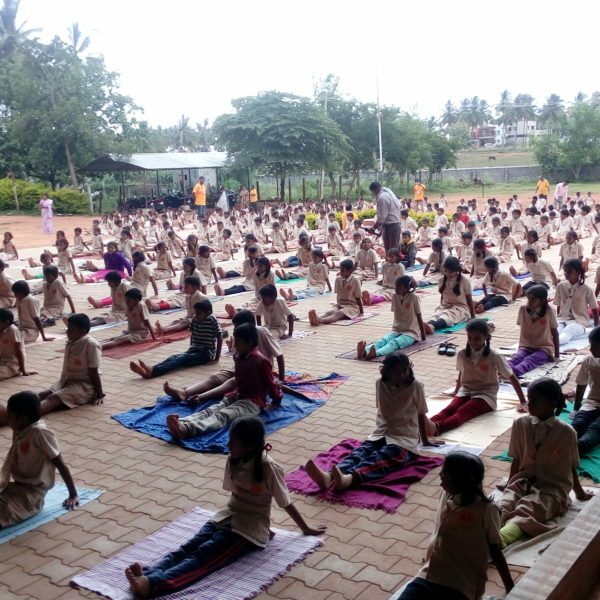 It was held on Nov-22nd 2018. 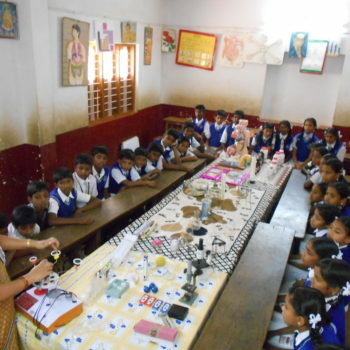 Injection TT was given to 1st standard to 4th standard students by the Health Department. 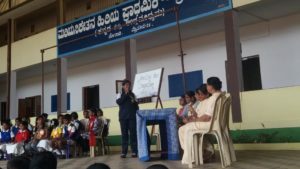 29th of Nov-2018 programme was conducted by the Education Department for special disable children. 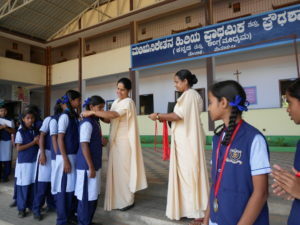 Prizes and all the needs were met by the primary school Head Mistress Sr Mary Celine. 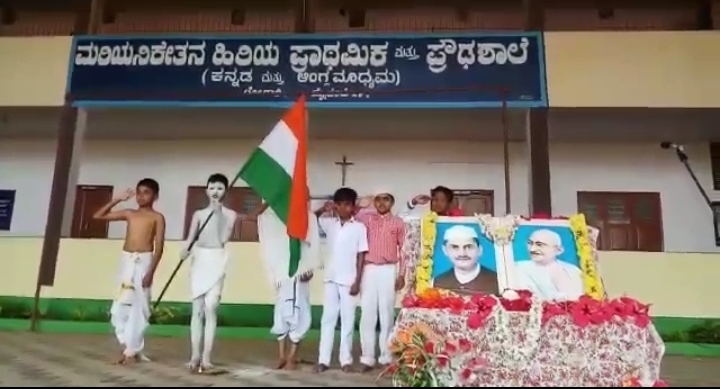 02.10.2018: Celebrated Gandhi Jayanthi in Maria Niketan School. 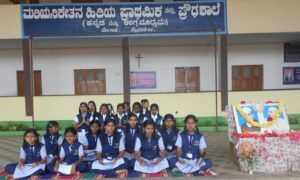 And cultural programmes were performed by students such as Inter religious programme. 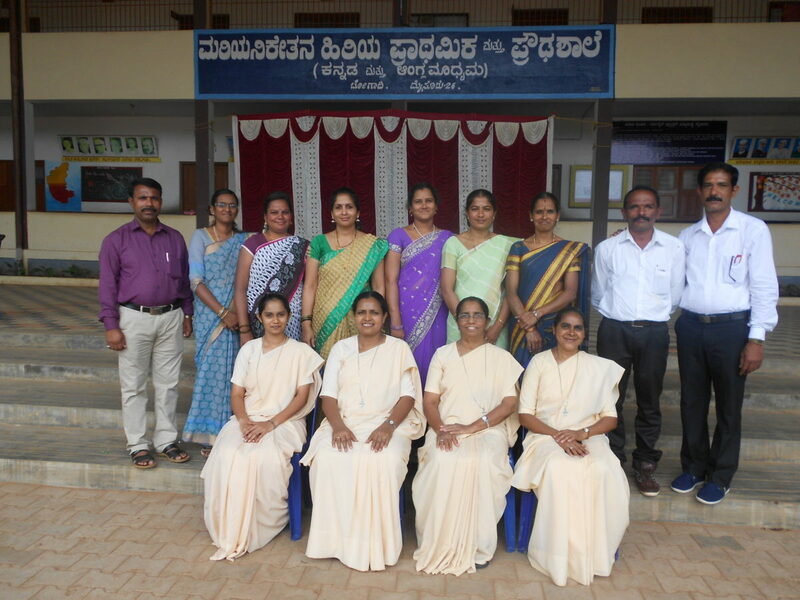 24.10.2018: Celebrated Valmiki Jayanthi. 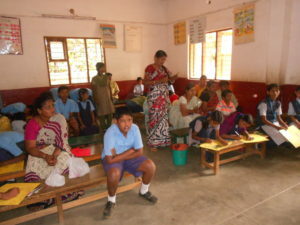 Programme was conducted by Maria Niketan Staff members. 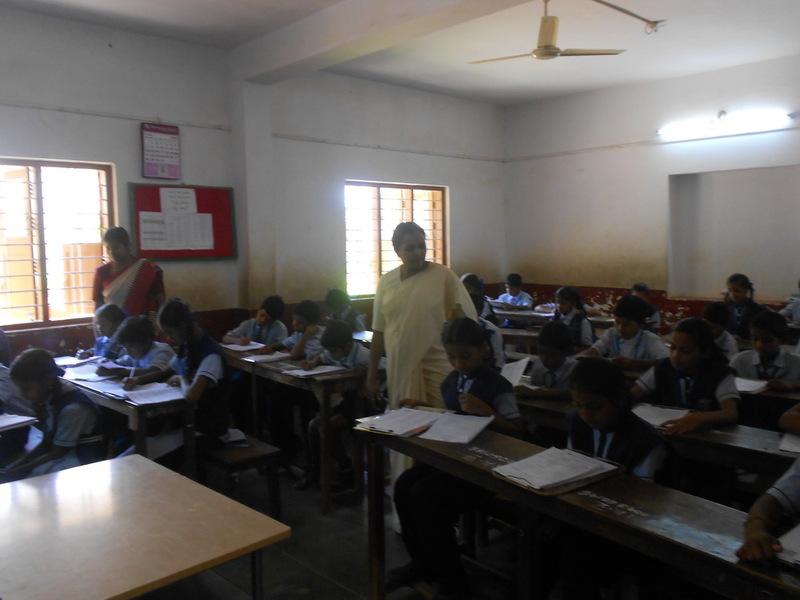 29-30.10.2018: CSAS-SA 1 Exam for 4th, 5th 6th & 7th Maria Niketan Higher Primary School was conducted from Education department. 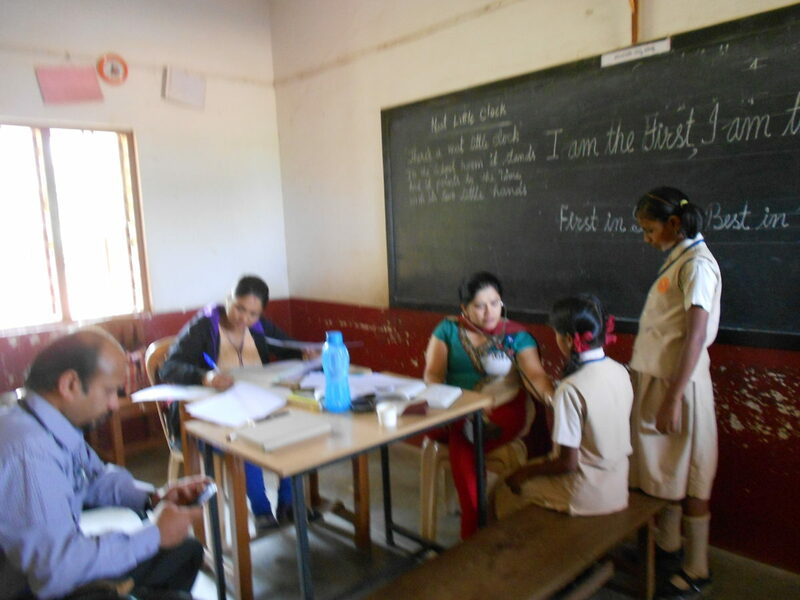 All our students appeared exam in a better way. 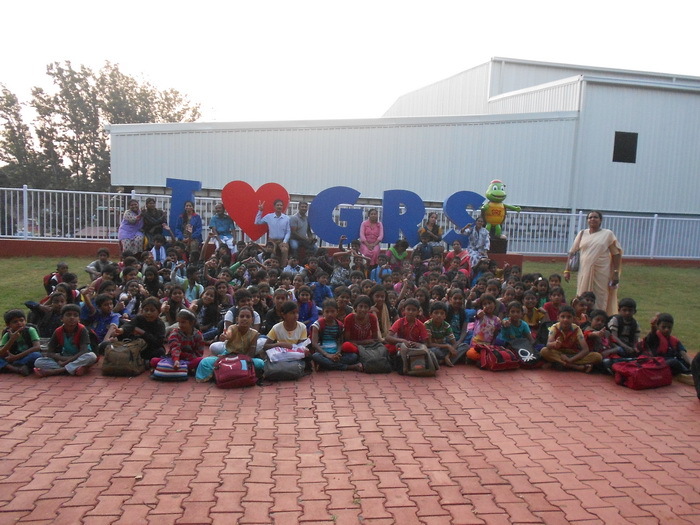 05.09.2018: On 5th Sep 2018 was celebrated in a grand manner. 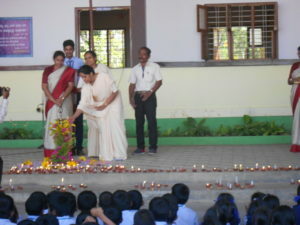 Teachers were welcomed to the dias in procession with lighted candles. 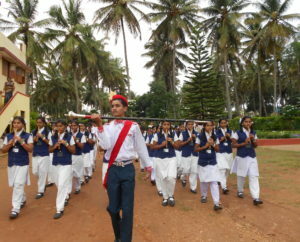 School students performed many activities like cultural program in respect to their teachers. 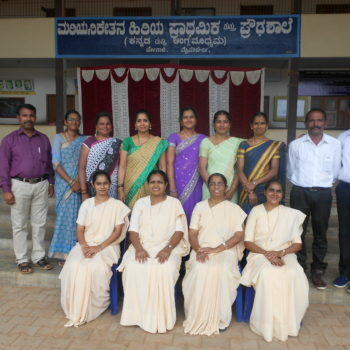 As already topic was given “A presentation on ethical role of a teacher” All the teachers participated in the given competition on the same day and secured prizes 1st 2nd and 3rd respectively. 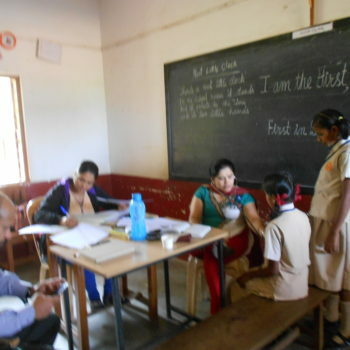 In this co Primary and High School teachers participated. All were responsible and enjoyed the day. 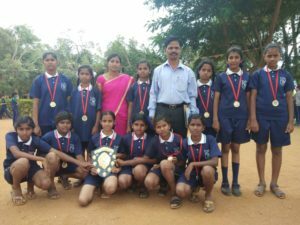 03.09.2018: On 3rd September 2018 Prizes were distributed for Students which held On 29th August 2018 Girls and Boys from Maria Niketan School participated in Taluk level Kho Kho and got 1st place and Same day other students participated Prathibha Karanji in Bogadi Govt School, class 3rd 4th 5th and 7th students. They also secured prizes. 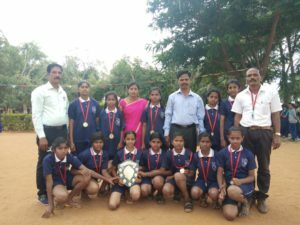 29.08.2018: On 29th August 2018 Girls from Maria Niketan School participated in Taluk level Kho Kho and got 1st place and selected for district level Kho Kho. Same day other students participated Prathibha Karanji in Bogadi Govt School and class 3rd 4th 5th and 7th students got prizes. 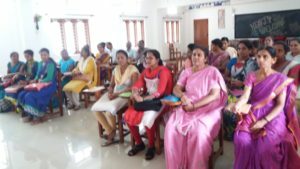 25.08.2018: P.T.A members meeting was held on 25th August 2018 at 10:30am. 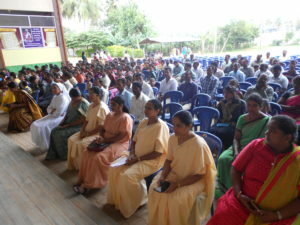 High School and Primary Teachers, Headmistress and Parent Association members were gathered. Headmistress was appreciated for the last academic year, for their service and gave sendoff. 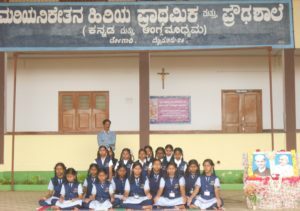 The new members were selected for the academic year 2018-19 as she congratulated them and requested to cooperate with the school activities which will be conducted. 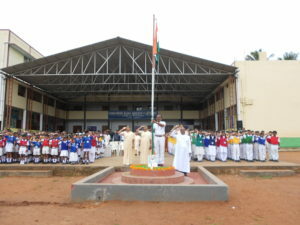 Independence Day was celebrated at Maria Niketan School ground on August 15th 2018, Rev.Fr Marie Raj, Parish Priest of St Peter Church, Bogadi, was the chief guest. 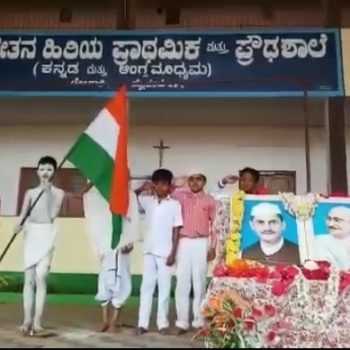 He hoisted the flag and honored mother India. He spoke in order to make our country progressive and developed, comparing to other countries we need to cultivate good discipline. 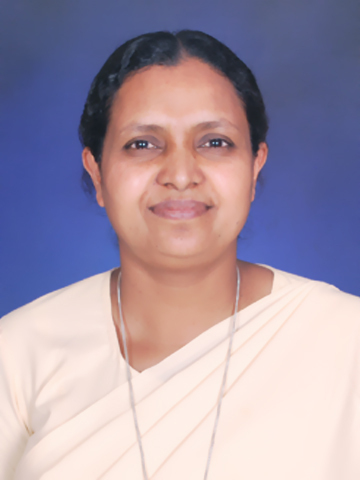 Rev.Sr Dr Annie M.A. 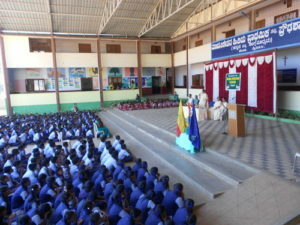 correspondent of Maria Niketan School, presided over the function. 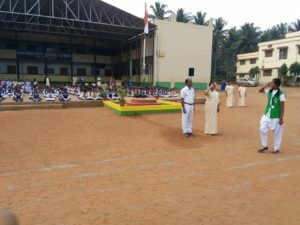 Various cultural programs were performed by students such as dances and songs etC., march past, drill and entertainment programs were part of the Independence Day celebrations. 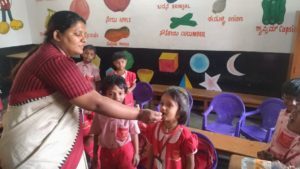 10.08.2018: On account of “National Deworming Day- Aug 10” children are given worm tablet from the Health Department , Bogadi, Mysore. 07.08.2018: On 7th August at 3:30pm we had joint meeting in Maria Niketan School. 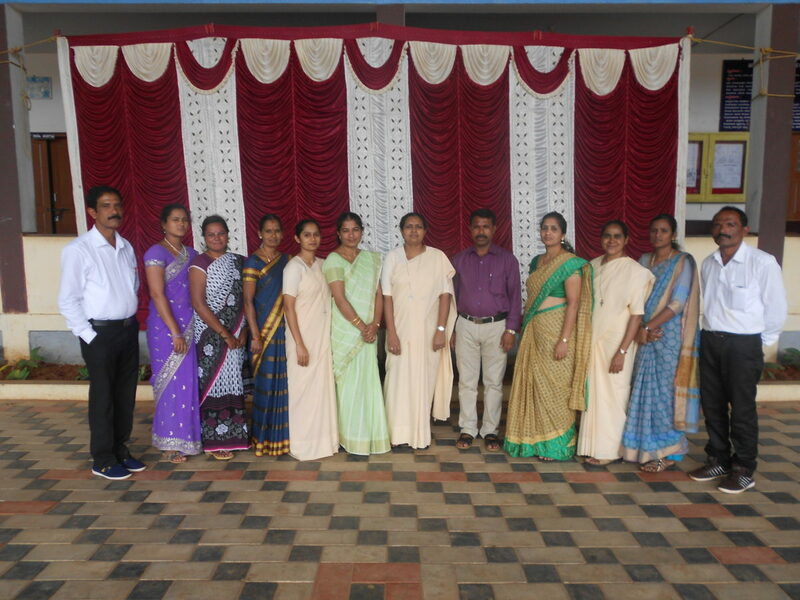 Rev.Sr Lilly Rodrigues (Deputy Secretary) of Mysore, Conducted beautiful meeting correspondent Primary and High School Teachers and Head Mistresses. 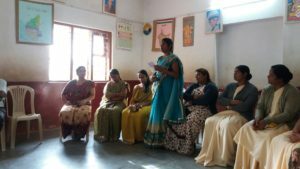 04.08.2018: On 4th August we organized Parent Teacher Associate Programme in Maria Niketan School. 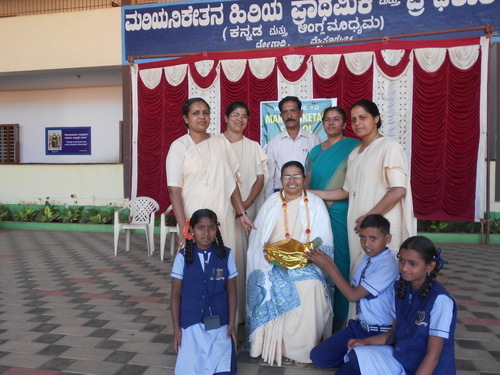 The Resource person was Rev.Dr.Sr Severine Menzes along with her School Correspondent Dr.Sr. Annie .M.A and the Head Mistress. 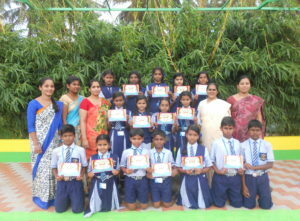 All the participated in the programme done and conducted well. 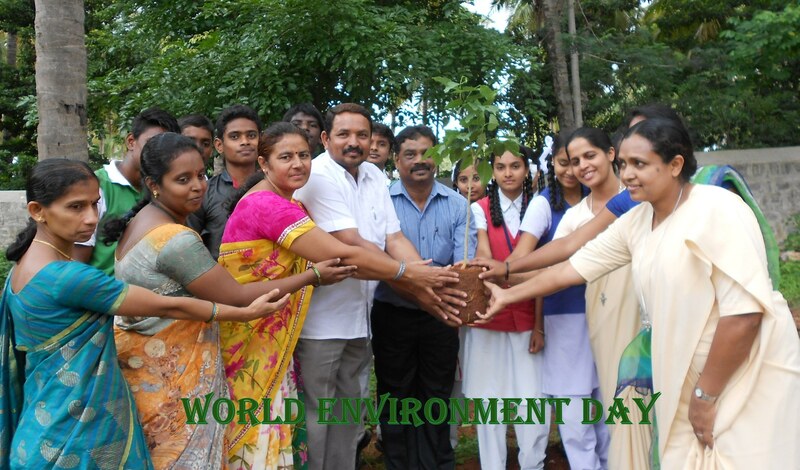 Environment Day celebration was very grand manner. 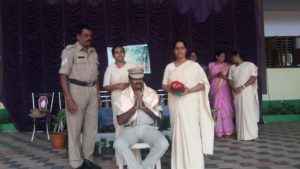 Sr. Mary Celine was the President and Mysore DYSP Mr. Prasanna Kumar along with his staff was the Chief Guest along with Mrs Prakash Mary and Pushpa Mary. 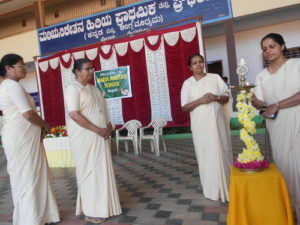 Sr Roopa Lopez organized the program. 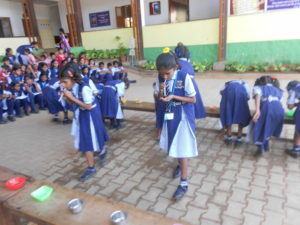 Guests were brought by band procession of children holding the seed balls. 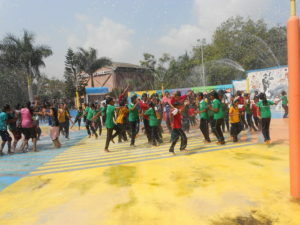 The theme “Save the earth, Heal the earth”. 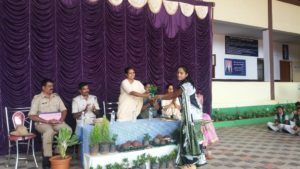 Chief Guest spoke very well on the topic, all teachers and students co-operated to plant the sapling. 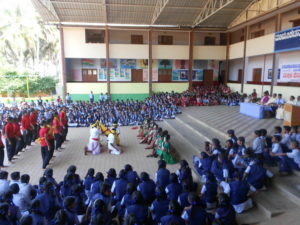 Action Song competition program was held for the Students of 1st and 2nd Standard. 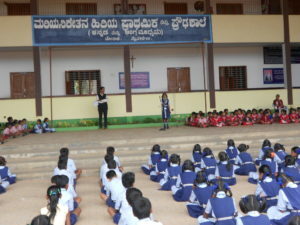 Spell -Be program for the 1st time it was held in our School. 3rd to 10th Kannada and English medium students took part in it. It was excellent! 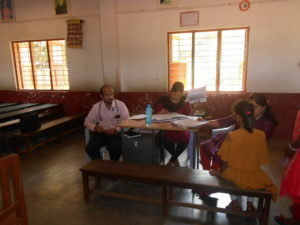 Teachers admired at their courage and special talent. 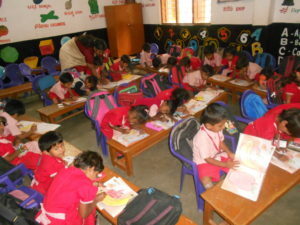 Hat’s off to children. 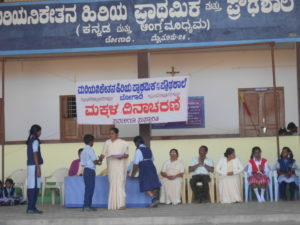 High School Head Mistress Sr Roopa organized the program. 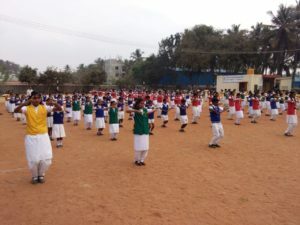 Students from High School and Primary participated in the competition. We admired at their innovative talents of creating best things out of wastage. 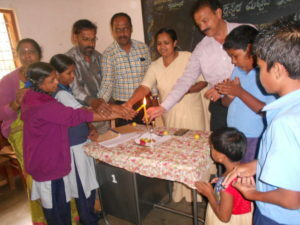 School reopening day celebrated along with the parents, students and school betterment committee members celebrated the day. 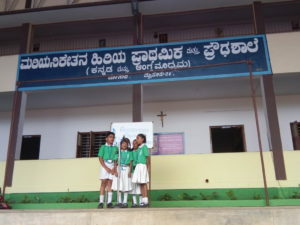 School was decorated with mango leaves. 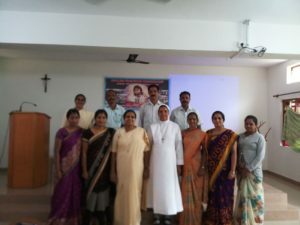 Rev.Sr Severine Menezes the resource person gave orientation program to our Maria Niketan Primary and High School teachers. It was a boost to all. 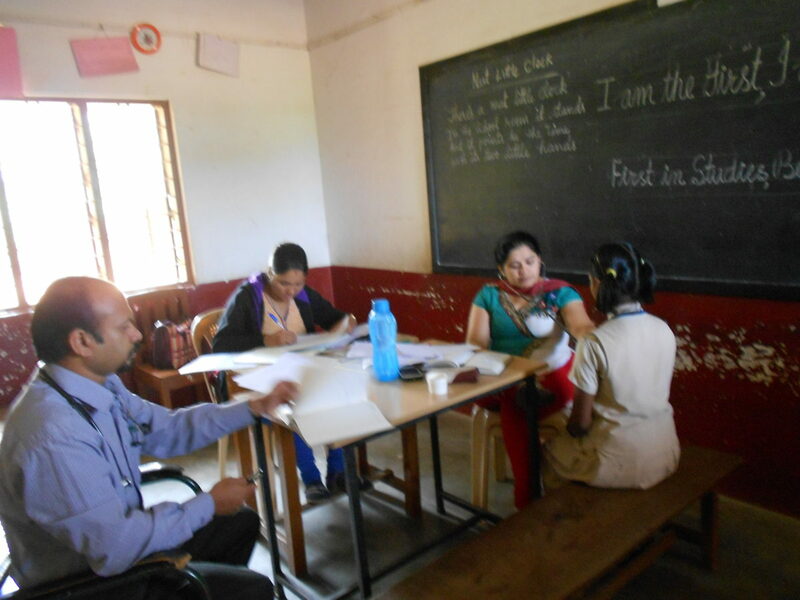 Angela Vidhya Niketan, Udbur teachers also joined for the session. 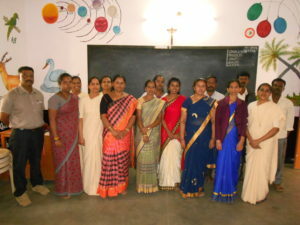 Teachers became aware of the present situation and how to face the problems while training the students for the new era. Thanks to both the Head Mistress.